NP Upadhyaya, Kathmandu: The SAARC regional body was not a cup of tea for the Indian establishment. Mrs. Indira Gandhi opposed the idea even at time of the establishment of the regional organization some two decades ago as she thought that the smaller neighbors of India in the vicinity were plotting some conspiracy against India. It was her inferiority complex. She took the regional body a ploy to gag India to which it was not. Later King Birendra was harassed by Mrs. Gandhi and her son Rajiv. A history now. However, it was not a design of Nepal and Bangladesh to harm India in any way or the other but yet the “conspiracy theory” continued to boggle the minds of the men in the British-India trained South Block. To recall India was born in 1947 after British India Company felt tired. Perhaps it was the Indian allergy to this regional body from the very beginning which may have prompted the smaller neighbors to secretly inch closer to China. And they did so much to the discomfort of New Delhi torture-machine. It was an exclusive blessing in disguise for Beijing. Fortunately, the opportune moment came for China through the kind courtesy of Nepal king Gyanendra who have had to pay a very heavy price later. China duped King Gyanendra later when the King needed China most. The Indian PM Dr. Singh instantly took a decision that it was time for the Nepali monarchy to say good bye from the world scene and it happened so as per the Indian desire. Shyam Saran did the rest of the job candidly albeit he may have drained some billions from the Indian national treasury for his sick pocket as well and some leftovers for mercenaries here and there. Some domestic fifth column in Nepal too encouraged Mr. Saran who was the foreign secretary of India then. China entered the SAARC organization with the Observer status soon after the institution of the Nepali monarchy was abolished under Indian instructions-it is widely believed. China, say high placed sources. Some leaders from the opposition too remain in league with the anti-China lobby that is functional in Kathmandu. China is thus in a constant fear of its own making. The Indian distaste for SAARC continues because Pakistan is one of the influential member of the regional body whose presence is what has been ailing India from the very beginning of the regional movement. SAARC is like an incurable migraine for India. As of today, frankly speaking, the SAARC is tentatively a dead body whose last rites remain to be performed. Rest in eternal Peace SAARC. Now the turn is of the BIMSTEC to say good bye for all time to come. It may take some time for BIMSTEC to vanish in the ethereal medium yet what is guaranteed is that India itself will cause its premature death because most of the countries in this Bay of Bengal initiative were now virtually close to China which is what shall pain and finally ail India to the extent that a design shall be made for the end—ceremony of the said organization. However, these countries assure India that they were with Delhi to which it is not. India can’t compete China. For example, Nepal, Thailand, Myanmar and Sri Lanka are the countries in BIMSTEC that are tentatively closer to China than India. Bangladesh too tentatively has come closer to China in the recent months. Yet Bangladesh and Bhutan have some compulsions to remain glued with India. Nepal is playing double under PM Oli. The rest of the countries understand that India promises only, China delivers and thus it is natural that the countries who accord top priority to the development of their country would opt for China over India and it would be this reason that shall annoy India to the hilt and encourage the latter to devise schemes that has the short cut to the demise of the BIMSTEC. Take it for granted. This enraged Pakistan to the extent that Islamabad preferred to leave SAARC for good, however, the active counseling of the Sri Lankan Foreign Minister Laxman Kadir Gamer, Pakistan stayed in the SAARC or else the regional body would have died some fifteen years ago. The growth quadrangle is dead. RIP. PM Oli too has summed up the BIMSTEC meet in his speech yesterday. He says BIMSTEC can’t substitute SAARC. This speaks more than what remains to be spoken. So when an well informed and knowledgeable media man like Ghimire sums up the meaning of the BIMSTEC for the common denizens of Nepal then what this branded white elephant with Indian trade mark has in store for the rest of the countries can be guessed in advance. Nepal shall benefit from BIMSTEC if the followers of Buddhism from Thailand, Myanmar, and Bhutan flock to Nepal as tourists. Lumbini trip could attract the Buddhists residing in these countries. The talk of Buddha circuit can be sold though. That is all. Thailand is honest member of the BIMSTEC unconditionally. India has met each and every leader in private and, as is usual and the Indian habit, and has pressed them hard to work in a way that suits to the interests of Delhi and were against Pakistan and China as well. But PM Oli talked about SAARC and Buddha circuit and saved his somewhat sliding prestige that appears to have been almost become Indo-pendent. This is the general allegation Mr. Prime Minister. “You have been cheating China”, claim matured observers. No body now talks of SAARC. This is the structured policy of India. 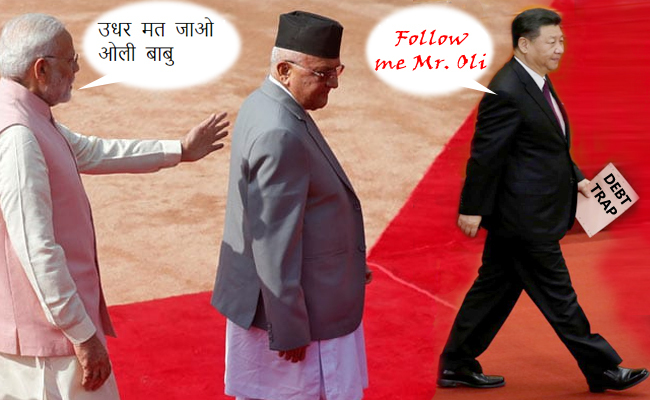 Oli has fallen in line with Modi at least this much is visible for now. We don’t have that much idea about PM Oli as Dr. KC has. As of Indian PM Modi, his inimical stance on Pakistan and China continues unabated. During the BIMSTEC he has trained the Bay of Bengal leaders to toe his line and denounce Pakistan. Modi needs no reason to denounce Pakistan nor his Modified media. A Joint military drill of the entire BIMSTEC members is being organized in India. Nepal too is in the said drill this Nepal is no more a nonaligned state. Joining this drill means to send wrong signals to Pakistan and China. All the sick minded people from India, academicians and media included, have defined Siddhu’s trip in a way that has suited to their personal political interests. The fact is also that Imran Khan is not just a cricket player now but instead Mr. Khan is a powerful political player in the South Asian horizon who shall in all likelihood match or even excel Modi’s performance. with the growing threat of terrorism and extremism. The training schedule for the Indian contingent includes target practice, house intervention drills, tactical and heliborne operations and combat conditioning, reports have said. By the way, former army officials loyal to the BJP were at a loss to explain why it was wrong for Mr Sidhu to hug the Pakistan army chief when contingents from the two countries were trying to sort out the menace of terrorism jointly and that too in a far flung country-Russia. In the meanwhile, Saudi Arabia and Iran are beginning a sort of competition for having increased influence with the new government led by Imran Khan in Pakistan. Both have big stakes involved. Pakistan’s position is crucially important to both Riyadh and Tehran. Pakistan is the second-most populous country in the Muslim world and the only Muslim state with a nuclear arsenal. Over 1.5 million Pakistanis live in the kingdom. Pakistan and Iran share a 900-kilometer (559-mile) border in Baluchistan. Pakistan’s population includes a significant Shiite minority, perhaps as much as 30% of the country. In the Saudi-Iranian competition for influence in the Islamic world, Pakistan is crucial. The interesting part is that PM Oli has not dared to put the Susta road expansion issue with Indian PM Modi. Adding insult to injury, the vibrant Nepali media too prefers to skip any events wherein India is involved. This is simply unfortunate. In the meantime time, writes By VARSHA TORGALKAR in a major crackdown across India, police in the recent days raided the homes of several human-rights activists, lawyers and journalists, accusing them of instigating violence at a rally in Bhima Koregaon, a small hamlet in the state of Maharashtra, on January 1. A case was registered by the police in Pune, a city in Maharashtra 180 kilometers east of Mumbai and just 40kmin from Bhima Koregaon, and investigators started to apprehend those who had allegedly instigated the violence. A key cause behind the violence was the degrading historical caste divisions that continue to exist in India. A number of human-rights and civil-liberties activists and lawyers attended the rally and questioned the policies of Prime Minister Narendra Modi’s government. Maharashtra is ruled by the Bharatiya Janata Party (BJP), which also leads the federal government.